Suri & Katie seen taking a stroll through Manhattan while on break from shooting her new movie, The Romantics on Friday, 20. 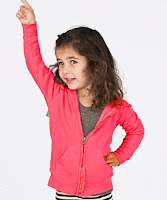 Suri is wearing Highlighter Skater Tank Dress in Pink and CozyChic Hoodie in White by Barefoot Dreams, which were both first worn on November 5th. 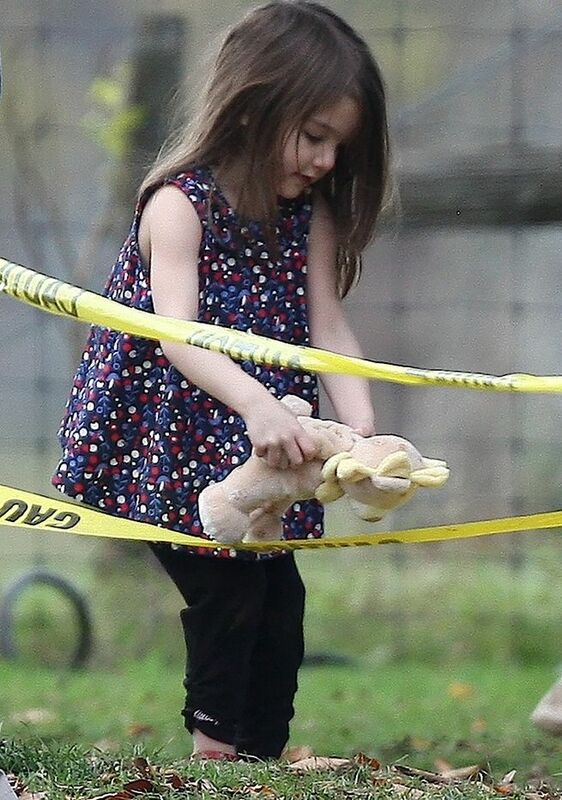 Look - heels are not always THAT fun but hey, at least she is not wearing diapers..
Suri play around with caution tape on the set of Katie movie, The Romantics on Thursday, 19. 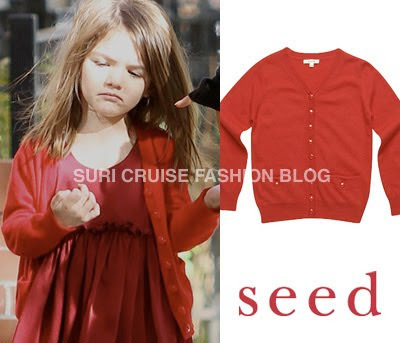 Suri is wearing Facet Button Cardigan in Cherry, which she first wore on October 26th and Printed Frill Blouse in Navy (FW'09), both by SEED. Suri is proving her love for the red shoes by wearing hers custom-made Roger Vivier flats again! iam on vacation and this stupid hotel charges 7 EUR per hour for Internet, and its not even wi-fi ?!!?! anyway, all updates for this week will be posted on the 1st of December. sorry again for the inconveniences! Tom and Katie Celebrate Three Years of Marriage! Check out this great Slideshow from popsugar. Suri is spending this week with Tom in Boston, while he is shooting "Knight & Day" and Katie is away in NYC working on "The Romantics". 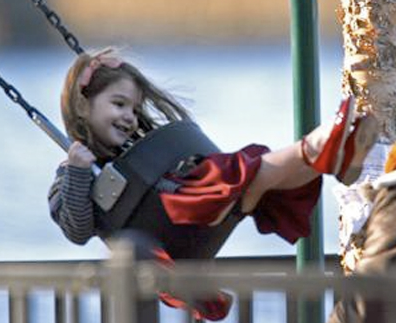 Suri & Tom were spotted having a good father-daughter time in a park on Monday, 16. Suri is wearing Red Silk Ruffle dresses from Holmes & Young Collection with Diamond Jacquard Tie Cardigan in Navy by SEED and custom-made Red Patent Ballerina Shoes by Roger Vivier, which she first wore on October 7th. 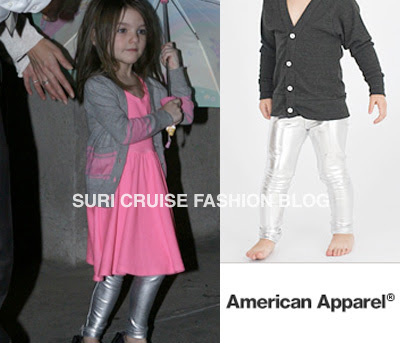 Who Wore It Better - Suri or Sunday? 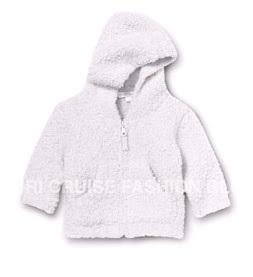 Both girls wore this White Cozy Hoodie by Barefoot Dreams, but styled it very differently..
Suri wore this hoodie over her Red Silk Holems & Yang dress, paired with black leggings and Studded maryjanes shoes by Maloles Petite on November 5th. I am not a fan of this look as i think this cardigan is too "heavy" for the silk dress..
Sunday opted for a more comfy & casual look, pairing her cozy sweater with colorful print tights & sand colored Uggs on November 17th. 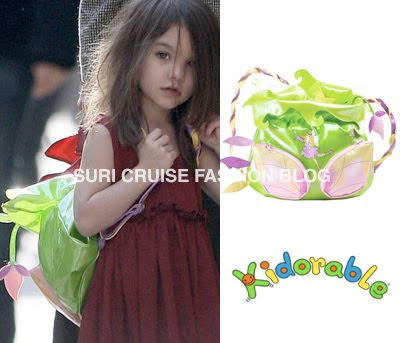 Suri & Katie braved the Boston rain on Sunday, 15 and went shopping at Jacadi. While Katie was dressed in a warm sweater and boots, Suri wasn't letting a little water get in the way of wearing her favorite peep-toe heels. 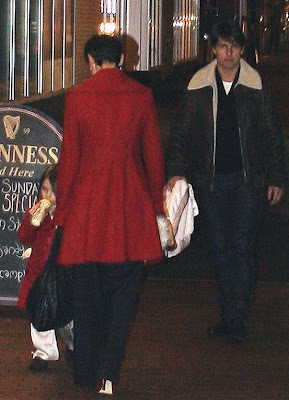 Suri stayed home that evening, though, when Tom took a break from filming Knight & Day to have dinner out with Katie. They dined at Abe & Louie’s steak house. 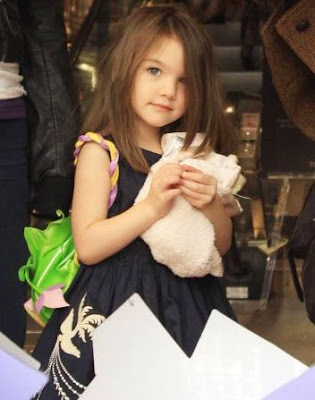 Suri is holding Elmo Plush Toy from Sesame Street Show. 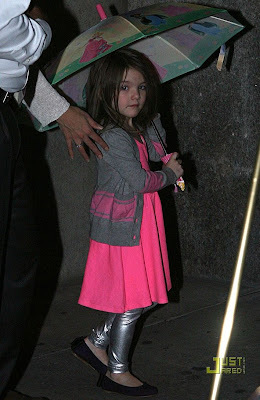 Suri had a slight mishap: She got stuck in the rain and slipped out of her high heel shoes. and later in the evening Suri & Tom went out for a walk and bottle break before bedtime. 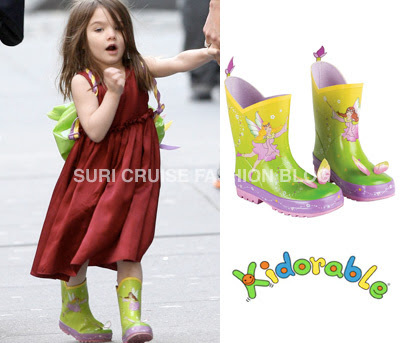 Suri and her anonymous BFF, both are wearing Francesca Girls Open-toe Shoes by Freed of London. i wonder, who that little girl is? 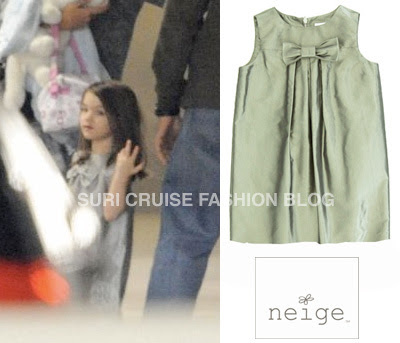 Suri wore this Pauline Silk Taffeta Dress by Neige, while spotted arriving to the "Day & Knight" set on October 22nd in Boston. 100 Followers AND 85+ Subscribers!!!!!!!!!!!!!!!!!!! i checked statistics, and it made my day!!! i didnt know that SCFB became that popular! comparing to the past statistics SCFB has really grown its audience during last 6 months! Thank You for your Loyalty!!!! Your feedback, comments & suggestions are always welcomed! 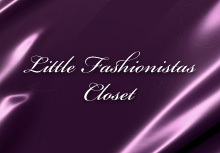 Stay tunned for new features and updates!! 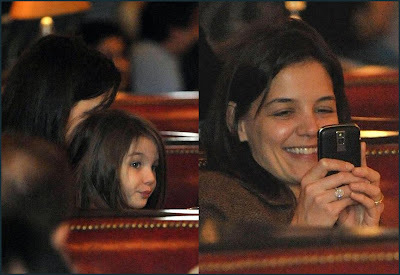 Suri & Katie ate dinner at Modern Pastry in Boston on Saturday evening, 7. 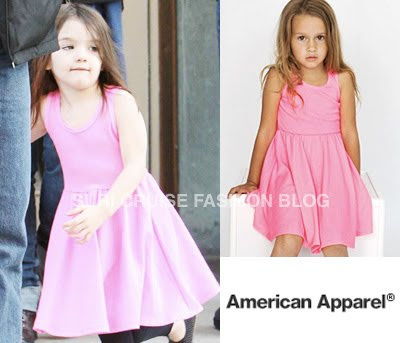 Suri is wearing Highlighter Skater Tank Dress in Pink and Shiny Legging in Lamé Silver, both were purchased on Friday at American Apparel store. 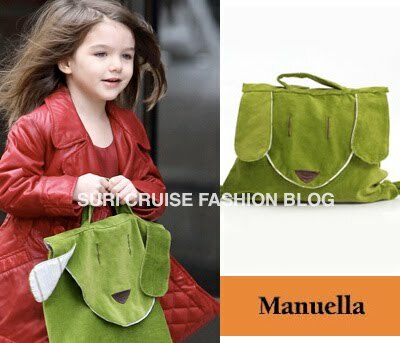 and in the morning, Suri & Katie were seen arriving in the Big Apple from Boston via the 30th street heliport on Sunday, 8. 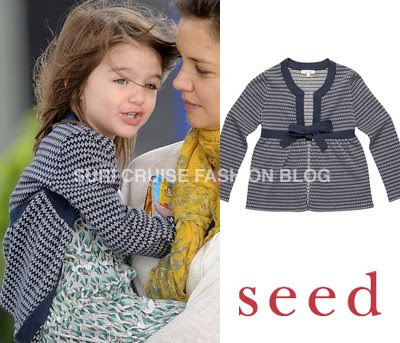 Suri is still wearing the same outfit, she only took off her shoes & changed the cardigan for her trusty Lurex Knit Cardigan in Jewel by SEED, which she wore several times before starting on October 4th. 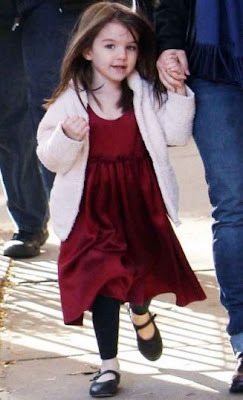 Suri & Katie wore matching Red Silk Ruffle dresses from Holmes & Young Collection, while strolling around Boston on Friday, 5. 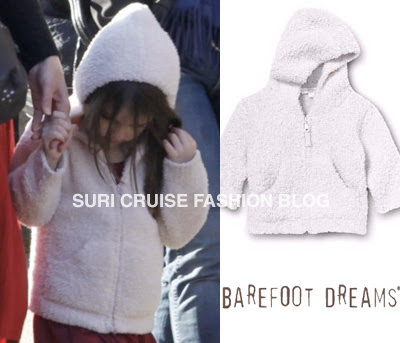 Suri is also wearing CozyChic Hoodie in White by Barefoot Dreams. 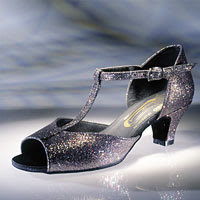 and a pair of Safir Leather Studded Pumps in Black by Maloles Petit, which she first wore on October 25th 2009. 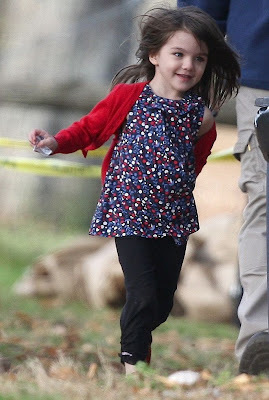 Suri joins mom Katie on the set of "The Romantics" on Long Island, New York on Thursday, November 5. 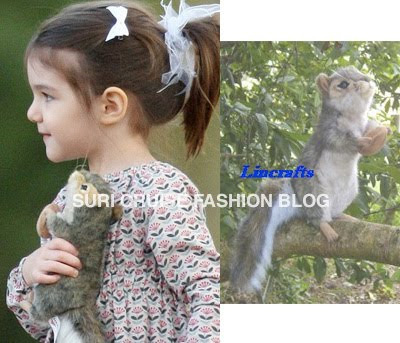 Suri carried around a stuffed friend - Standing Grey Squirrel with nut by Lincrafts. 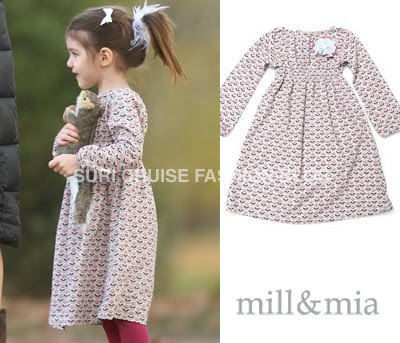 Suri is wearing Print Shirred Dress in Tulip Floral Print Cord by Mill&Mia and Cotton Spandex Jersey Legging in Raspberry from American Apparel, shich she first wore on July 22nd 2009. 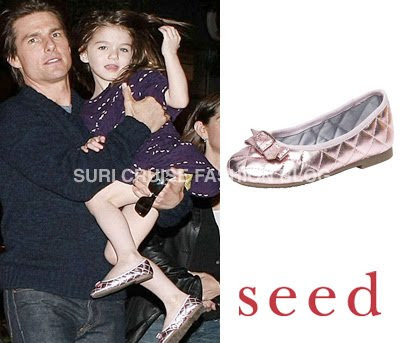 Suri is also wearing Purple Quilted Bow Shoes from FW'09 by SEED, which she first wore on September 18th 2009.